In 1953 Rolex introduced its first diving watch, the submariner. The reference 5512 was launched in 1959 and continued until 1978. 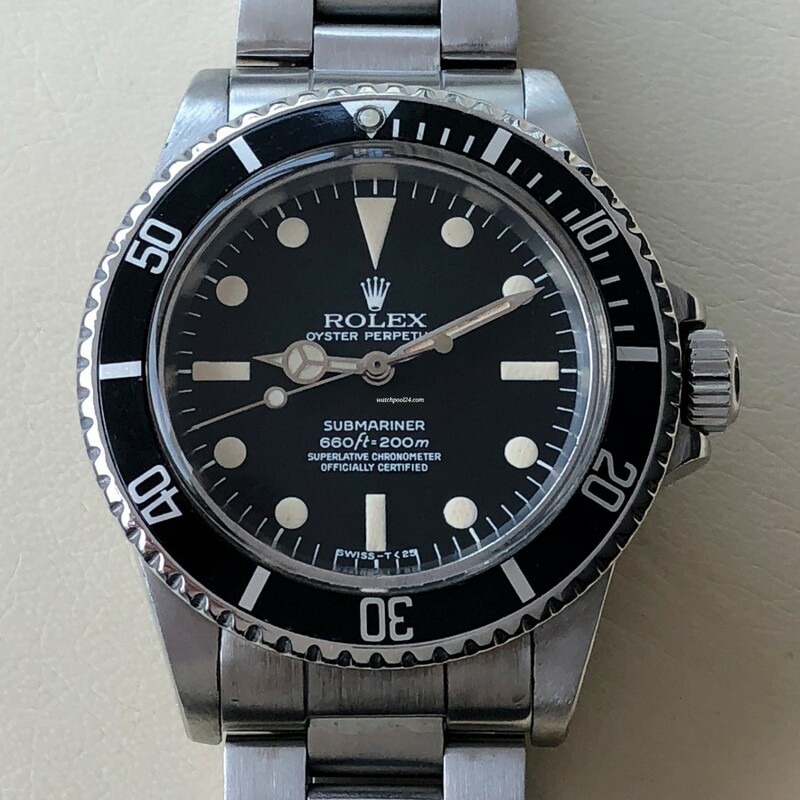 This particular 5512 dates from 1978 and represents the last run of the Submariner 5512 production. The Submariner 5512 was produced with both two-liners and four-liners. Models produced during the second half of the model’s run show four text lines above the 6 o'clock marker. The difference between the reference 5512 and the reference 5513, which was produced from 1962 until 1989, was the chronometer certification of the 5512, which is displayed on the dials of the watches. This model was famously worn by Steve McQueen. There are 5 variants of the Maxi Dials. This particular model has the Mark III Maxi Dial which is in mint condition with luminous material still present in the dots, having aged to a light creamy color. The 100% original lume in the hour, minute and second hand is totally intact and shines beautifully under UV light. The 40mm stainless steel case with pointed crown guards is in excellent condition and slightly polished. The Rolex Submariner 5512 is powered by the 26 jewel, Chronometer movement calibre 1570. The watch comes with the original Rolex 93150 bracelet with 580 end links. Compared to the Rolex Submariner 5513, The reference 5512 is rarer, due to the shorter production period. The Submariner was the world’s first watch designed for sport diving. For this and many more reasons it is the ultimate collectors item.